Stila In The Know Eye Shadow Palette ($39) is a new palette for Fall 2012 that is a permanent addition to Stila's core collection. 'In The Know' features ten neutral eye shadows, all in matte finishes and a smudge stick eyeliner in Halfmoon - a matte, soft charcoal grey. The palette also comes with an instruction booklet to re-create looks with detailed application tips. The quality of Stila Eye Shadows in general are pretty good. They don't have too much of fall out and blend well. However, the shadows in this palette were a tad more powdery and had quite a bit of fall out. It is probably because of the lack of shimmer and the matte finish that makes the texture a little less creamy than the ones with a metallic finish. They do blend pretty well though and stay put without creasing with a good primer on. A few ways in which I like to use matte shadows - Darker colors on the crease and to set smudgy eyeliners ; lighter, close to skin tones shades to blend out or soften one or more colors; subtle browns & beiges as a wash all over the lid. Not to mention the dark brown that will double up as a brow filler for dark brows. The palette also comes with a limited edition smudge stick called Halfmoon, which is a matte, soft grey. The texture of the eyeliner is extremely soft and stays put for a good 5-6 hours. It does sting a little when applied on my waterline so, I keep it to my upper and lower lash line. The eyeliner goes well with the whole matte look that the palette is based on. Overall, a really nice palette for matte eye shadow lovers, but I just wish the textures were just a little more smooth with a little less fall out. 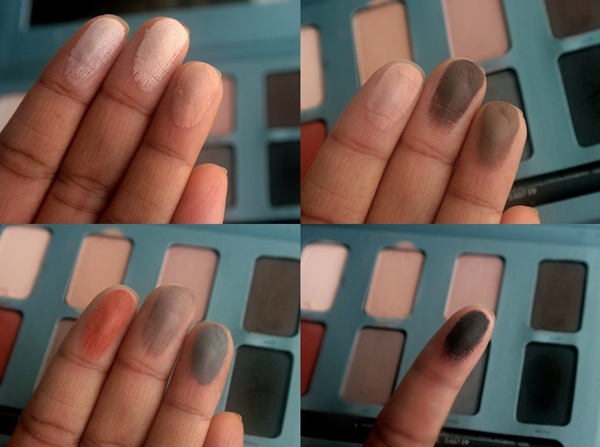 The colors are perfect if you prefer everyday neutrals in matte finishes. Have you tried the Stila In The Know Eye Shadow Palette?